The picture below is worth a thousand words. And $50 trillion. This was just released by the Bank of Japan as part of their new “flow of funds” reporting. 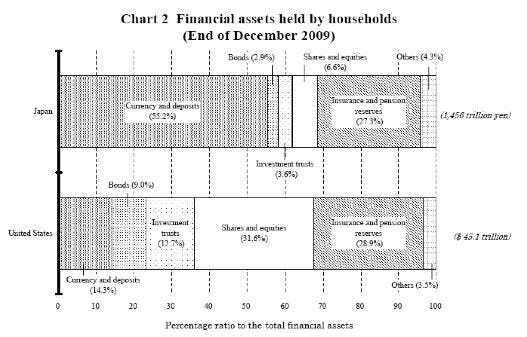 Basically, it outlines the composition of Japanese household assets versus counterpart households in America. The major point of note is the discrepancy in savings versus equity investments. Recently, there has been speculation that Japan is not saving as much as it used to. This is a critical issue for the Japanese economy. That debt must be financed. Under most circumstances, the interest payments involved would be crushing. But Japan has so far dodged that bullet by selling government bonds almost entirely to domestic investors. Investors willing to buy even at ridiculously low interest rates. Helping the government keep its debt service payments minimal. Japanese citizens have been able to buy these bonds en masse because of the nation’s high savings rate. Households had a lot of cash and needed somewhere to park it. A decline in savings could be catastrophic for the nation. If domestic investors no longer have enough to finance the government debt, Japan could be forced to look to foreign investors. Who will almost certainly demand higher interest rates. Potentially triggering a debt crisis. But the figure above suggests savings are still going strong in Japan. 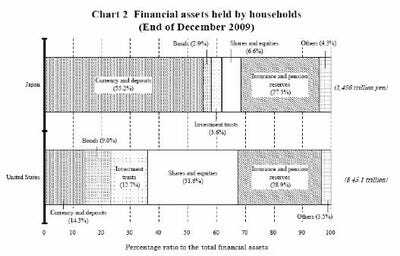 Currency and deposits make up over 55% of assets for Japanese households. Compared to just 14.3% in America. This represents about $8.9 trillion in savings that could potentially be mobilized to support the Japanese government debt. Americans by contrast, hold a far greater amount of their wealth in the stock market. U.S. households have over 30% of their assets in shares and equities. As opposed to just 6.6% in Japan. Americans are certainly beginning to save more. U.S. savings are up by $1 trillion since the financial crisis broke in 2008. Today, assets in currency and deposits for U.S. households total a not-insignificant $6.4 trillion. But in terms of the ratio of savings to government debt, Japan is still far ahead. Japanese household savings are over 100% of outstanding government debt. With the American government now sitting $12.7 trillion in the red, household savings are only at 50% of debt. It seems that Japan is still winning the “vault wars”, for the moment.